Looking for the best nachos supreme recipe? 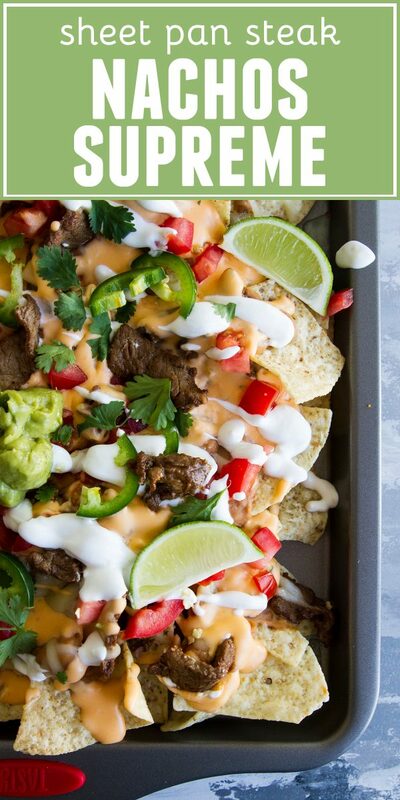 These Sheet Pan Steak Nachos Supreme have tortilla chips that are topped with a creamy cheese sauce, beans, seasoned steak and all kinds of toppings. 1 – game day food. 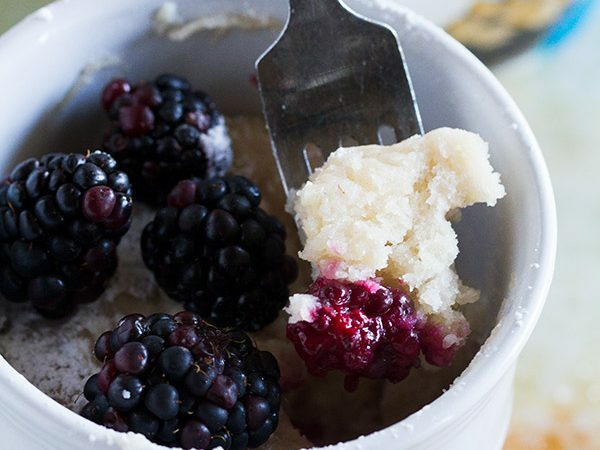 Ok, ok – so maybe I like the food more than the game, even. But there’s nothing wrong with that, right? 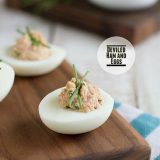 Give me all of the tailgating and game day party food. I may not have a favorite team, but I will definitely show up for the food. 2 – the sheet pan. 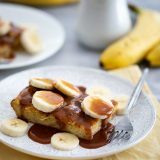 So this sheet pan trend has been around for a bit now, but I seriously can’t get enough of it. Make enough food to fill a sheet pan, then feed a crowd. 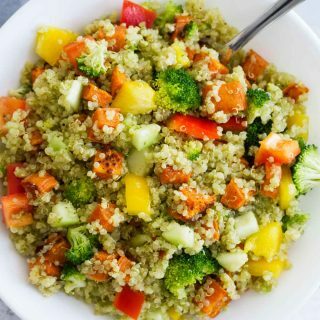 Sheet pan meals are easy, and easy to share with others! So what do you get when you combine the game day food and my beloved sheet pan? 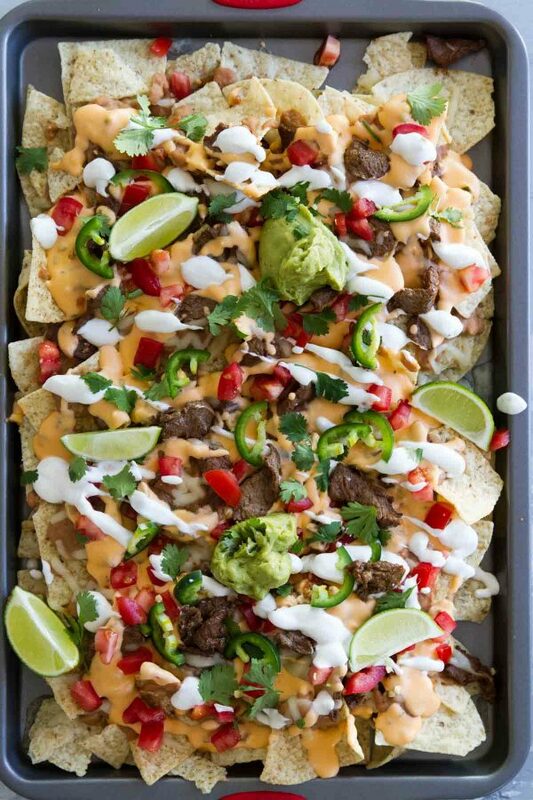 Sheet Pan Steak Nachos Supreme! 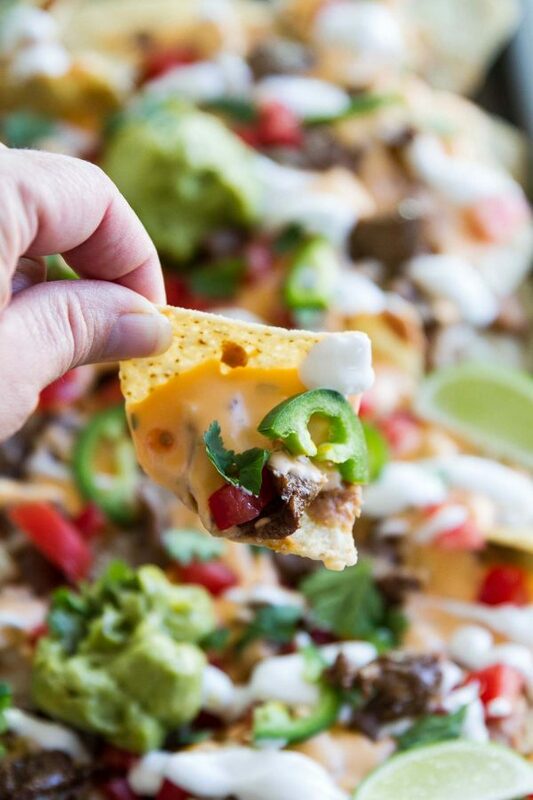 Nachos are the ultimate game day food. 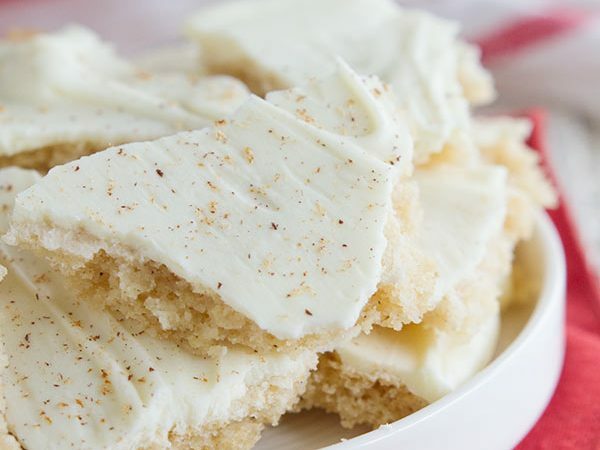 They are perfect for sharing at that tailgating party – especially when they are made on a sheet pan! 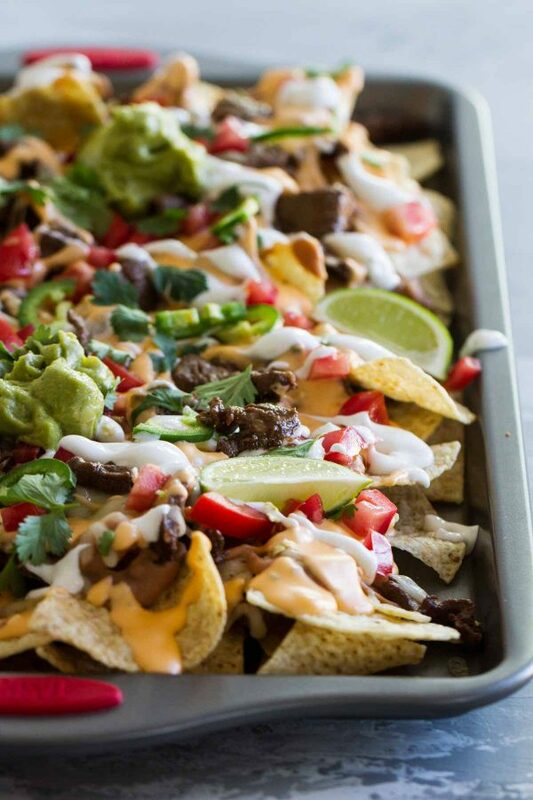 And today, I’m showing you my new favorite nachos recipe – the Sheet Pan Steak Nachos Supreme. So let’s get down to it and talk about everything going on in these wonderful nachos. What do you put on nachos? Usually, when you see nachos supreme, they are made with ground beef cooked with taco seasonings. And while there is nothing wrong with that at all, I decided to step things up on this one and use Walmart Angus Premium Choice Beef. Their Angus NY Strip Steak is my very favorite. The steak has superior marbling, which means better flavor and better tenderness. And I love that they sell USDA Choice steaks so that I know I am getting consistent quality. All of this at Walmart’s low prices! 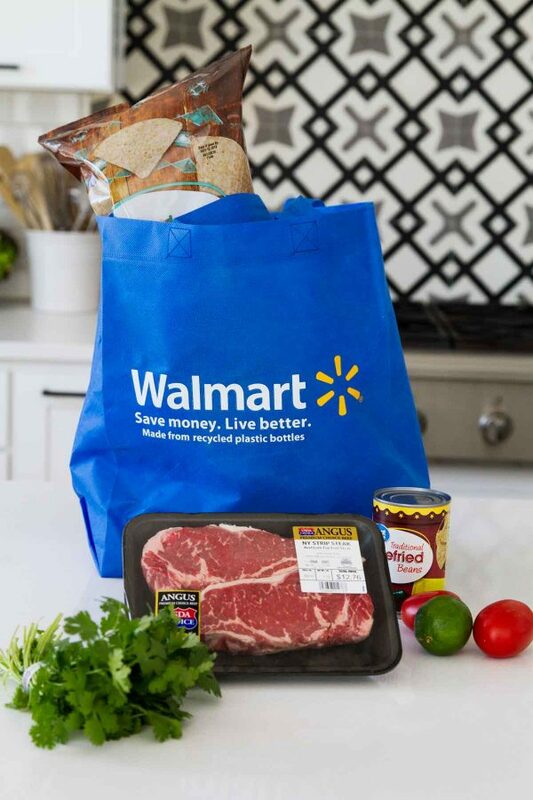 Speaking of Walmart – I am also loving the Tasty line of kitchenware and gadgets. It is all super colorful and fun – everything from sheet pans (like the one featured in this recipe) to can openers, garlic presses, and measuring cups. Plus, they are all super affordable! For the nachos, I also make a quick queso. You can definitely just melt cheese on the nachos, but nothing says game day to me more than nachos with cheese sauce. This cheese sauce recipe is super easy. 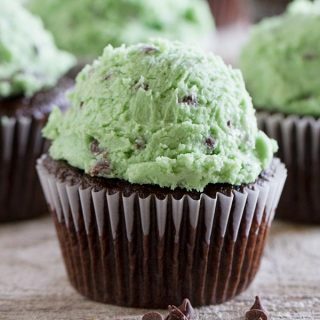 It uses my secret ingredient – cream cheese – to make the cheese sauce creamy and smooth. I also top the nachos with refried beans, tomatoes, sour cream, jalapenos, cilantro and guacamole. But feel free to get creative and throw on whatever you love best on your nachos! Nachos supreme are pretty easy to make. One of my biggest tips is to make 2 layers. If you just put the tortilla chips on the sheet pan and then load on your toppings, you end up with lots of chips on the bottom that never see any of those toppings. But by making 2 layers, you make sure that all of your tortilla chips get some of the toppings. I also like adding cheese in two different ways. I will put on some shredded cheese – for these I used Mozzarella – and let that melt. And then the whole thing gets covered in that easy cheese sauce. And bonus – the cheese sauce can even be made ahead of time and then heated up when it’s time to assemble the nachos. If the sauce is too thick, you can thin it out with a little bit of milk. Make sure you don’t assemble your nachos supreme until it is time to serve them, though, as the chips will get soggy after a bit. 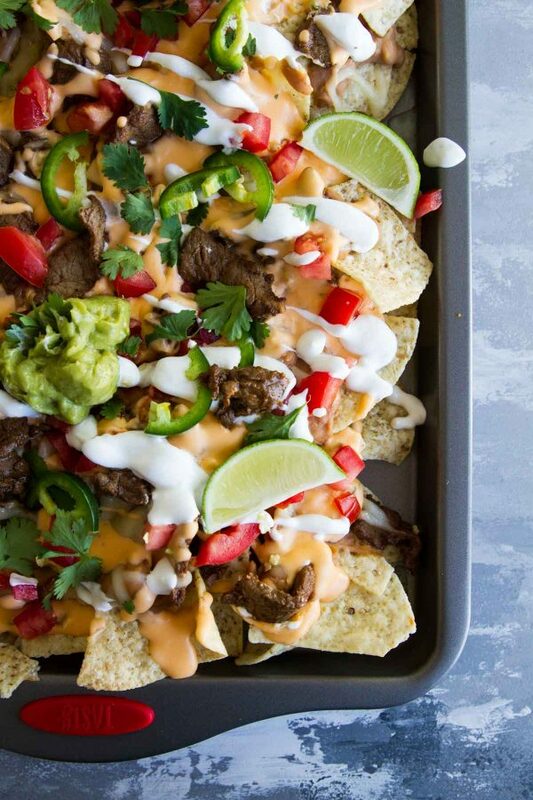 Game day has never looked as good as it does with a pan of these Sheet Pan Steak Nachos Supreme! Cut the steak into thin strips against the grain. Combine the soy sauce, olive oil, garlic, cumin, chili powder and smoked paprika in a resealable bag. Add the steak, close the bag, and gently shake to coat the meat with the marinade. 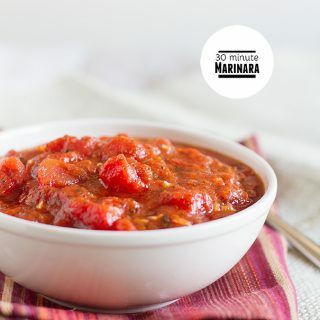 Marinate in the refrigerator for at least 1 hour, up to 4 hours. To make the quest, melt the butter in a saucepan over medium heat. Add the garlic and jalapeño and cook until softened, about 1 minute. 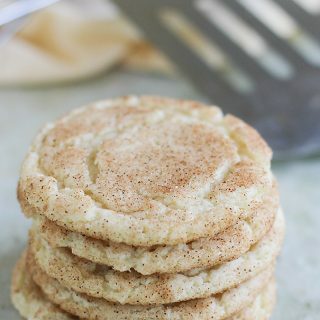 Whisk in the cornstarch, then slowly add the milk, whisking constantly. Continue to cook until it comes to a boil and thickens slightly. Add the cream cheese and whisk until smooth. Add the cheddar cheese a bit at a time, whisking in between additions. Place over low heat to keep warm until needed. Heat a large skillet (preferably cast iron) over high heat. Add half of the steak pieces to the skillet, spreading out into a single layer. Cook until browned on one side, then use tongs to flip the pieces to the other side. Cook until browned, then remove the steak to a bowl. Repeat with the other half of the steak. Open the refried beans and transfer to a medium saucepan. Add a couple tablespoons of water, then heat over medium heat until the beans are heated through and smooth. Place half of the tortilla chips on a large sheet pan. Drizzle half of the beans over the top, then place half of the steak over the beans. Sprinkle on half of the shredded mozzarella. Repeat the layer with the remaining chips, beans, steak and cheese. 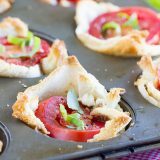 Place in the oven and bake until the cheese is melted and the nachos are warmed through, 5-7 minutes. Remove the nachos from the oven and pour the cheese sauce over the top. Top with sour cream, tomatoes, jalapeños, cilantro, guacamole, and lime wedges. DISCLAIMER: Meat should reach an internal temperature of 135ºF. 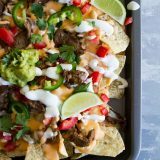 *If you want to easily drizzle the sour cream over the nachos, you can whisk in a tablespoon of milk to thin it out a bit.